Going out for a jog or a brisk stroll could be very difficult, especially for new parents. The reason is that strollers can be quite troublesome to maneuver on an uneven terrain. This is where jogging strollers, which are constructed with three bicycle-style wheels, come into play. These are very helpful, especially if you are a new parent who wants to keep up with your healthy lifestyle. With so many models available on the market now, how do you choose the best one? 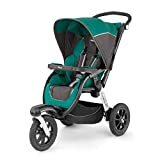 Luckily, we have here a rundown of our top 7 recommendations for the best jogging strollers, along with a detailed description of their best features, pros, and cons. In addition, we have rounded up all the essential factors that you need to consider when choosing a quality jogging stroller. Read on if you want to know more. A traditional stroller would do just fine if you are walking around on a smooth pavement or around the mall. However, if you plan to jog, run, or go through bumpy sidewalks and rugged surfaces, it would be necessary that you have a jogging stroller. These strollers are specifically crafted to absorb the bounding which comes along with uneven surfaces and intense speeds. And the most important aspect of having it is that it keeps your baby or toddler perfectly comfortable and safe. Jogging strollers, unlike the traditional ones, come with three large bicycle-style wheels in a triangular configuration, which makes it capable to glide over uneven and rough surfaces, as well as a suspension system that effectively decreases the impact of the jolts on your little one. Having this type of stroller would also mean that there will be less pushing on your part. While most traditional strollers would not allow you to run or jog with it, jogging strollers can also be used as a daily stroller for your baby or toddler. It is surprising that you have the option to attach an infant car seat into a jogging stroller. However, it should be noted that you cannot use the jogging stroller to jog or run until your baby is at least eight months old. The reason is that your kid will not be able to keep his head and neck up, especially under the impacts of the bounces and jolts. But once you have the capability to go over rough pavements, you surely would get a lot of useful years out of your jogging stroller, as most of them can accommodate kids of up to five years of age. Jogging strollers generally have a front wheel, which is locked permanently to ensure that the stroller stays on its path. 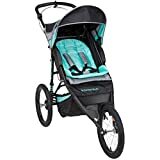 Others, on the other hand, have front wheels that swivel, allowing you to maneuver the strollers easily when walking but has the capability to lock in its place when you go running. A safety tether is a leash that you circle around your wrist while attaching to the stroller, to ensure that you will not lose your grip on the handle. As with normal motorcycles and automobiles, a parking brake is used whenever you come to a stop. Quality jogging strollers, interestingly, feature a handbrake that effectively slows the stroller down. Like a car seat for your baby, the seat of jogging strollers come with a five-point harness that effectively keeps your baby secure and in place. When choosing a jogging stroller for your child, make sure that you consider one that features a large canopy to protect your baby from the sun. To add, you may want to consider choosing one that comes with a built-in peekaboo screen, wherein you keep an eye on your child while you run. A reclining seat would certainly be helpful, as it lets your child lay back while you are running. First off on this review is the BOB Revolution Flex Jogging Stroller, which features a high run-ability and maneuverability. 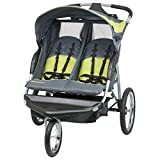 This high-quality jogging stroller is a great option for new parents who want to get out in the sun, even on an uneven path. It is a relief that the BOB Revolution Flex jogging stroller features an adjustable tracking and handlebar, an adjustable suspension, and a locking swivel front wheel. These features are very important, as they offer everything a serious jogger would want. However, it is noteworthy that this jogging stroller may not be suitable for new parents who have difficulty lifting heavier things. Nonetheless, it would be a great choice for running off-road, all thanks to the adjustable suspensions, as well as the wheels that have more substantial tread. The BOB Rambler jogging stroller features a locking swivel-front wheel that adds extra stability when you are jogging, as well as mobility while you are on the go. It comes with 12-inch air-filled tires and a mountain bike-style suspension system that provides you a smoother ride. It also is equipped with a one-step foot-activated parking brake that secures its back wheels when you stop. Another great feature of the BOB Rambler jogging stroller is that it has no rethreading, allowing you easier adjustments. It is also travel system ready, as it is highly compatible with the BOB Infant Car Seat Adapter. The Schwinn Arrow jogging stroller is designed for an aerodynamic, stable, and for long and fast runs. It also looks sharp while offering a lot of awesome features. It comes with large 16-inch tires on the front and rear, which are all lightweight and durable. It also features a rubber grip with a center handbrake that effectively slows the front wheel. It also is equipped with rear shocks, as well as a large canopy enough to protect your kid from the sun. What’s great about this canopy is that it has small speakers that you can connect to an MP3 player or smartphone. It also features a storage basket, an adjustable handlebar, and two cup holders. Lastly, it comes with a peek-a-boo window, which allows you to keep an eye on your little one while you are jogging. The Chicco Activ3 jogging stroller features an integrated removable arm bar and is compatible with all Chicco KeyFit and KeyFit30 infant car seats. It can be on a compact one hand standing fold or a flat trunk fold or quick release wheels that allows you to save more space. What’s great about this jogging stroller for infants is that you can control the park brake, the swivel lock, as well as the fold release just by using the adjustable handlebar. This jogging stroller also comes with a large extendable weatherproof canopy and a reclining seat that will provide your child with maximum comfort. Lastly, it is equipped with an adjustable Flex Core suspension system, which allows you to choose between a firmer ride if you are jogging or a soft ride if you are on a bumpy path. 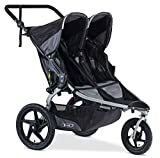 The Thule Urban Glide jogging stroller earned great reviews when it comes to run-ability, as well as maneuverability. This specific combination of advantages certainly made this jogging stroller one of the best jogging strollers on the market now. It is very easy to use, with a covered storage, a comfortable seat for your little one, and a large canopy that will protect your baby from the sun. In fact, you can use it as a daily stroller, instead of buying two strollers for different purposes. As with most jogging strollers, the Thule Urban Glide 2.0 jogging strollers becomes larger when you fold it, making it not suitable for those with smaller vehicles. However, with its awesome features, which include the locking swivel front wheel, simple fold capabilities, passenger stow pockets, as well as its reasonable and competitive price, you surely would get great value for the money you pay for it. 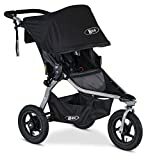 As you may have noticed, BOB is one of the go-to brands when it comes to strollers and this offering by BOB would be a great option if you are searching for the best jogging double stroller. It has a topnotch quality, with features that include air-filled tires, adjustable mountain bike-style suspension system, and a locking swivel front wheel. It also comes with an adjustable handlebar, which is very comfortable regardless of your height. It can also fold up very easily and it keeps your baby comfortable, safe, and secure with its padded seats, a large canopy, and ventilation. It features two seats that can be adjusted separately. These seats can also recline to a flat position, in case your children want to nap. The Baby Trend Expedition jogging stroller features large bicycle tires that allow it to roll effortlessly over all types of surfaces. It also comes with a parent tray, a child tray, an ergonomically-shaped rubber handle, and effortless trigger fold. Choosing the best jogging strollers would now be a lot easier for you, now that you have read our reviews on the top picks, as well as the buying guide on how to choose a quality jogging stroller. All you need to do is to evaluate the features, pros, and cons of each product to be able to determine which one benefits you and your baby the most.